Australian Picture Books and Inspirational Editors. I’m excited to welcome a new picture book into the world. Australian picture book, The Three Emus hit the book stores in February. Yes, I know it’s March! Life has been a little crazy-busy, so I’m behind. Don’t judge! At least this year I’m on a roll with blogging. Let’s hope I maintain the momentum. 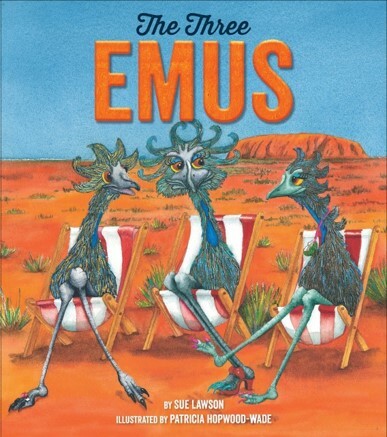 The Three Emus, illustrated by Patricia Hopwood-Wade and published by The Five Mile Press, tells the story of three emu sisters who live among the mulgas and spinifex of Central Australia. When one of the trio loses her security ‘shell’, the emus embark upon a search around the nation. They encounter roller-coasters, Canberra’s Parliament House, Melbourne’s Trams and quokka in search of shell. The Three Emus is my third picture book, and Patricia’s first. Patricia Hopwood-Wade was born in Belgium, has lived in Canada, and now calls Hobart home. Patricia is well known for her art work, especially her quirky and fun emus. 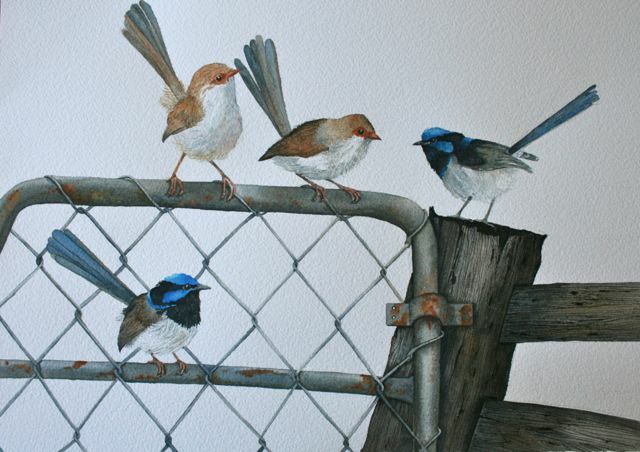 She also paints less quirky birds and other gorgeous things, including robins and wrens. Patricia’s art has been highly commended at many exhibitions and in competitions. It was through her success in the Five Mile Press Illustration Competition that we came to work together. Former Five Mile Press Editorial Manager, Karen Tayleur teamed us up to create a zany romp around the nation. Patricia’s bold and bright colours and those nutty emus certainly make it that. It was a pleasure to work with Karen Tayleur again. Karen was my editor at Black Dog Books for many years. Since we first worked together on Allie McGregor’s True Colours, there’s been Finding Darcy, the Diva Series, After and Dare You. And now, The Three Emus. Her understated approach and insight makes you believe you can do anything. I am truly privileged to have worked with her. She’s played a major role in my development as a writer. The Three Emus is available now, on line and at all good book sellers.